I have a lot of events and classes coming up, but before I leave town, I wanted to share a quick sketch and process with you. It's been a while since I posted something made on vellum. I had a drawing in my head, and I thought this would be perfect for a vellum sketch. I'm using a deluxe, heavyweight drawing vellum, so it has a slight grayish cast to it, but takes marker ink beautifully. 1. 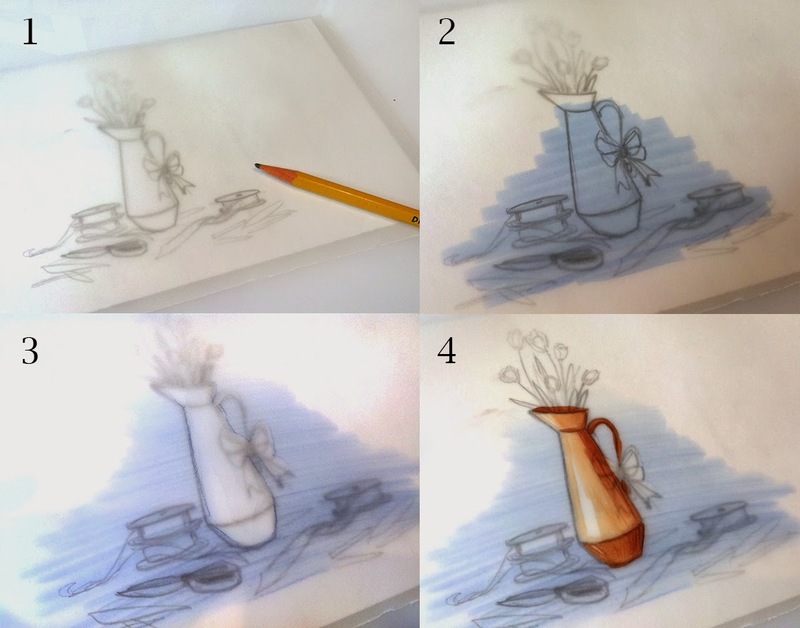 I started with a pencil sketch and overlaid a piece of vellum. I taped it down with masking tape to keep it in place as I colored. 2. Next, I work back to front. I begin by laying down some solid swatches of B45. 3. With my colorless blender, I went back over all the blue, to soften at the edges. I colored in the same direction as the original streaks. I want some streakiness to remain, just not as harsh on the edges. Then, I use my colorless blender to clear out the inside of the vase. Because marker ink does not soak into vellum, the colorless blender can completely remove ink, if you soak it enough. I was careful to wipe my blender marker tip clean on scratch paper after each stroke over the blue. 4. Then I added E33 and E27 to the pitcher. I left the white area clear, and did minimal blending. Blending on vellum can turn streaky quickly. 5. Next I added the YG17 and G99 right over the top of any other colors. Although the greens are lighter, they will simply push other colors out of the way. 6. I added R43 as my pale pink. If you notice, all colors appear a little lighter on vellum, so go darker than you regularly would when coloring, or colors won't show up. 7. I touched up the pinks with RV29, and minimally blended it with the R43. 8. I finished up by pulling the sketch out from underneath and looking at areas that needed cleaning up. I darkened the brown with E49 and touched up a bit more RV29 and G99 to add details. I love how soft and simple the finished image looks. And, it was very quick, as you can't go back and blend without causing streaks. If you don't color on vellum much, I strongly recommend trying it sometime. This weekend I will be teaching a couple classes in San Diego. I still have a few openings in my upcoming classes in San Diego, Salt Lake City, and Pittsburgh. We have other copic classes coming up in Chicago, Dallas, Phoenix, Seattle, and Minneapolis, so visit our website to register or get more information. You can also email nancy@copicmarker.com for more registration information. If you are in Oregon, I will be hosting a free drop-in studio event at the U of O Bookstore on May 17th. Click here for more details. Ongoing: $5 Wednesdays, 4:00-5:30pm Tracing Memories drop-in dinner classes at Sheldon Park Assisted Living, Eugene. Call 541-344-1078 to RSVP. Final touches make all the difference in my opinion. Yesterday I showed you my goose, at the 95% done stage. Today I'll show you what I did to complete the image. Contrast is the key to a well balanced image. When you have nice crisp whites, and rich dark colors, your image looks much more complete. 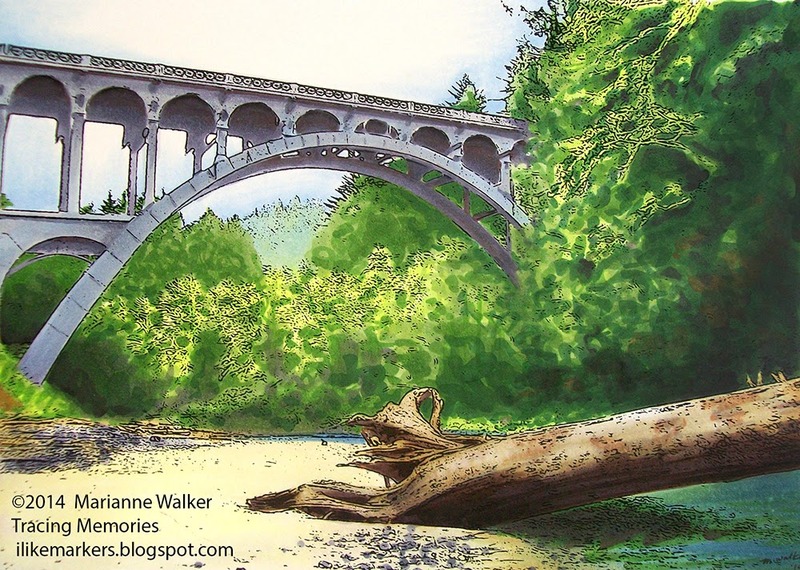 But, fine areas are tricky to leave white when coloring with markers, so artists use Opaque white, a thick white waterbased paint to add white highlights back when coloring. 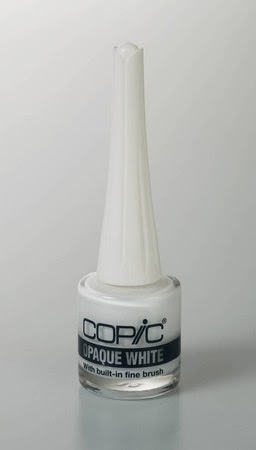 For a couple years, I have been working with .Too, the manufacturer for Copic products, to create a different version of our Opaque White paint. Because the Opaque White is so thick, it won't flow through traditional paint markers in a way that we were happy with, but we've wanted a better way to apply fine details with it. So, we developed this new bottle with a built-in, super-fine brush. These are now available and very handy. I use mine for everything, and it has a spot right in the middle of my desk. I love it! As you can see, the brush is very fine. It is perfect for all the little white glints on the goose feathers, the white around the beak, and any other fine highlight areas. Whenever you apply opaque white, be sure you are completely done coloring with markers, as you can't color over the top of the of Opaque white without risking damaging your marker nibs. I love how fine the details are! The brush tip is perfect for very precise detailed areas, much finer than the detail you can get with a white-out pen or white paint marker. The long handle fits your hand perfectly, giving you enough length that you feel more like you are using a traditional paintbrush. The white paint is very thick, meaning that even though strokes are fine, they are very opaque. Here is my goose, with the final touches of opaque white added, and color-corrected on the computer. We will be using the new Opaque White with built-in brush at our upcoming workshops and classes. For those of you who want to use your own applicators, you can still purchase our larger bottles of traditional Opaque white. Meanwhile, we encourage you to register for one of our classes. They are filling fast and are a great way to get a chance to experiment with our products. New classes just opened on our website! I will be teaching a Whimsical Faces & Hair class along with a Tracing Memories class in Salt Lake City on May 10th. You can now register for those classes here. Either of these classes is perfect for beginners, no Copic experience needed! April 12, Chicago, IL Intermediate Certification taught by Debbie Olson Filling Fast! April 12, Dallas TX Intermediate Certification taught by Lori Craig Filling Fast! April 12, Phoenix AZ Whimsical Faces & Hair taught by Cindy Lawrence Filling Fast! Monday I was at the park, on a rare sunny spring day (it usually rains in Oregon this time of year). The park was covered in geese, so my daughter and I tried to get them to come close enough to photograph, but without any food, they really weren't interested. I was able to snap a quick shot of one, and today I wanted to draw and color it. 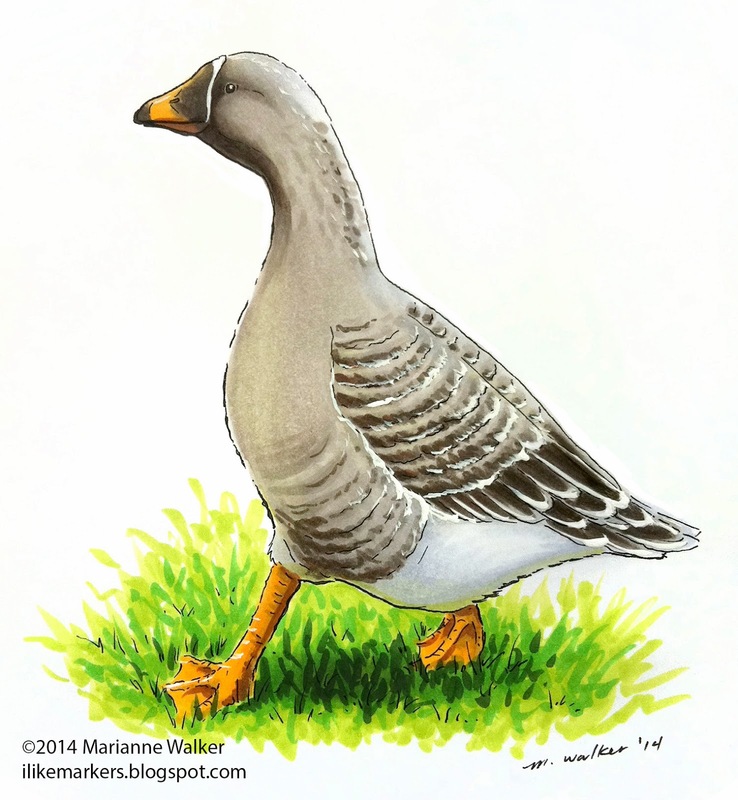 Today's tutorial is the first half of coloring the goose drawing. Tomorrow I'll show you the final touches. Recently, I've shown you a lot of photographs the computer has converted to outlines for me. Yesterday, I drew the duck with a 0.3mm multiliner, then photocopied the drawing onto nice paper. The overall tone of this goose is a warm gray, so I start by blocking in the basic W1 to define shadows. I didn't soak the paper too thoroughly, as I knew I would be blending more colors in. 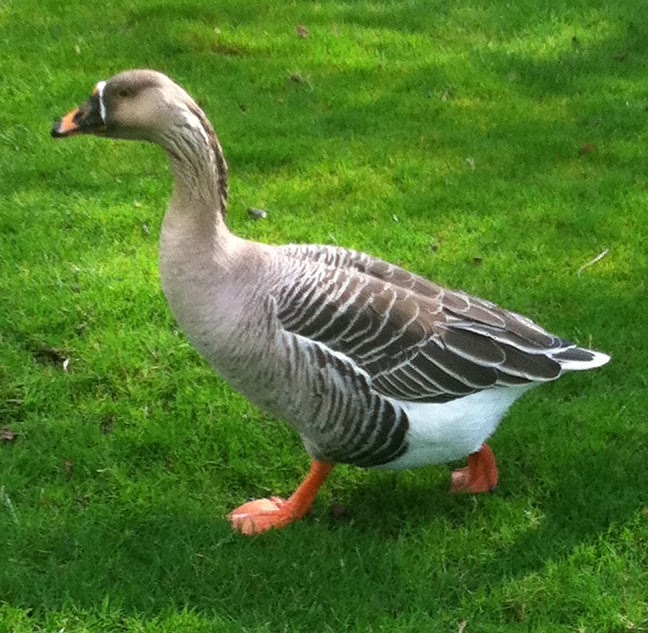 I left his white belly alone, as in the photo, you can see that is a very cool gray area, whereas the rest of the goose is warm gray. Next, I layered in W4 for the shadows. 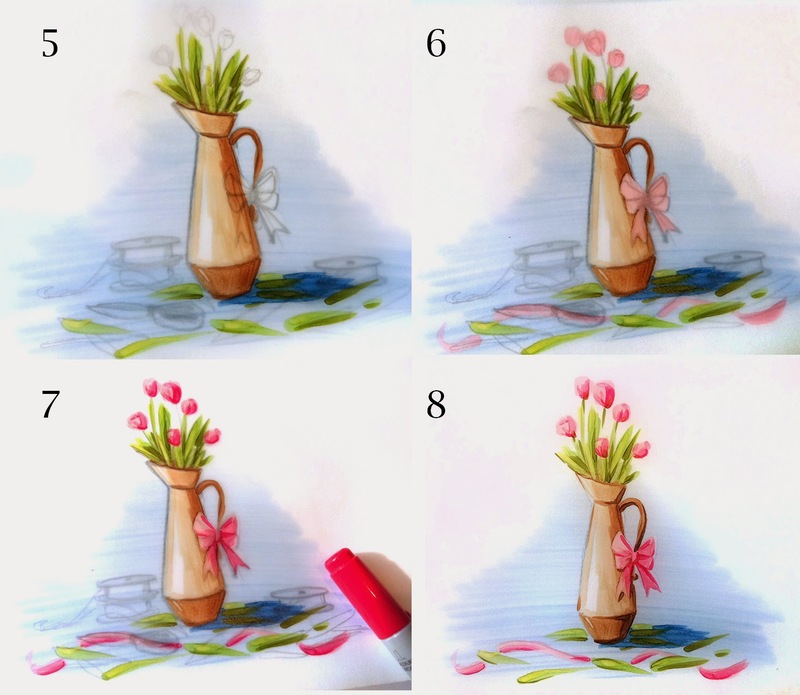 Always look at the photo for reference on the shadows and details. On the neck, I added a few rough feathers with the W4 as well. At this point, I haven't blended anything. The next step is to blend the W4 with the W1. Any areas that faded out too much, I let them dry and added more W4. Contrast is the key to having a believable image. Next I added W7 for the darkest feather areas. Again, I blended it with the W4, but in areas that became too soft, I let them dry and added more W7 over the top. I was careful to keep the cheek and the top of the head as light as possible, to match the coloration from the photograph. If you look close, you can see that I applied the W7 in small, irregular strokes on the wings to simulate the edges of feathers. For the yellow/orange beak and feet, I used Y32, Y38, and added deepest shadows with W4. I know I can shadow the yellows with Warm grays, since yellow and orange are warm colors. On the white belly, I colored the edges with BV20, as that is a nice, gray blue-violet to contrast the warm grays on the rest of the goose. I threw in a few hints of Y00 and W1 onto her belly, to warm up those tones as well. Next I begin on the grass. I added YG03 as a base coat to the grass. This was applied as lots of short, irregular strokes, in kind of a scribbling pattern. Without any other colors, it already begins to look like grass. This is a great texture to practice. For best results, hold the brush more upright, as you will get finer lines. I didn't feel like overwhelming the picture with green, so I stuck to creating a basic ground-plane for the goose to be waddling across. Even though the photo shows the whole area green, it is my artistic choice as to how much green to include. Here is the final goose, with a few more details. I added YG09 and G28 to the grass, again in the short, crisp brush strokes. I added hints of E27 to deepen the shadows on the feet, and on some of the darker feathers. By adding brown, it gives a hint of color variety to the shadows. I also added a tiny bit of YG03 very lightly to the edge of his white belly. Although it is not in the photograph, I did this to suggest a reflection of the green from the grass. Tomorrow I will show you a few more final touches to this goose. I hope the step-out today helped you see my process. This weekend I was at the coast and took a quick photo at one of my favorite beaches, Devil's Elbow/Heceta Head. This afternoon, I converted it to outlines and colored it in. I colored the sky with B41 and 0. The trees are YG01, YG03, YG61, YG63, YG67, G28, C7, and hints of YR18. The old log is Y28, 0, E49, V99, BV23, and E27. The bridge is BV23, BV25, C3, C9, B41, and V99 for the deepest shadows. The water is YG63, B45, C7, and YG67. The sand is W1, E50, Y28, Y00, BV23, BV25, with 0. It took me about an hour to color. As you can see, this was quick. But, each time I look at it I think of so many memories with my parents, my siblings, my husband, my kids, my friends...It makes me happy!! This will be one of the images we color on Wednesday if you are in Eugene and come to my Sheldon Park Assisted Living dinner session. $5 reserves you a spot and dinner, 4:00 to 5:30 pm. All supplies included (these sessions are weekly, just call ahead to reserve your spot 541-344-1078).